Write it, sing it, play it. : Robin drama...leaving the nest. 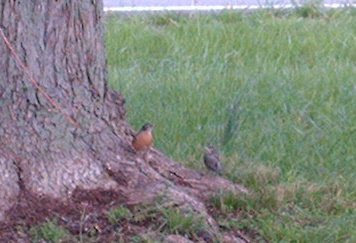 I was taking my nightly Robin baby picture and just after I snapped this one, it flew away!! Mama and Daddy Robin came flying over to me squawking, flapping and trying to dive bomb me. 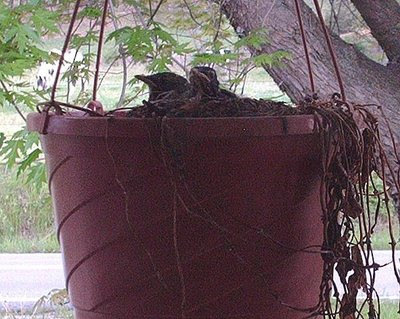 They immediately started running off all the birds in the trees and watching over the baby that flew out of the nest. Boy were they were pissed off at me! The little robin hopped across the yard and sat at the bottom of this tree where he stayed for a while. They continued to feed it and make sure no other birds (or humans) got too close. It couldn't fly high enough to get up in the tree, but I think it's going to be okay. So now there are two left in the nest. I am going to go outside this morning and see where the other one is. 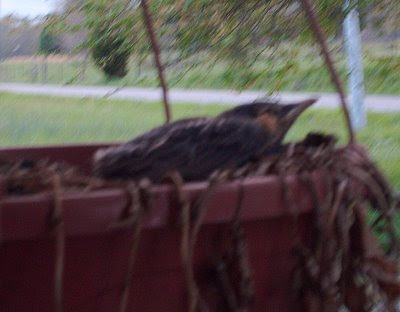 I noticed Mama robin flew around the side of the house with worms in her mouth, so I think that is where the baby is. I'll keep you posted. I am sure that it was ready to leave the nest, but probably wouldn't have done it until today. I bet Mama and Daddy Robin are still cussing me.